The Trek line rolled into 1996 with a little bit of structural damage. The TNG lineup was pretty much done after the 1995 release that finally produced Tasha and made some amends for the Generations figures. The Movies lineup was kind of abandoned before they produced the whole crew in Wrath of Khan uniforms, but all of a sudden we were getting a ton of TOS figures ahead of the 30 years of Star Trek. The DS9 lineup seemed to be doing okay, but a lot of figures remained unproduced. The Generations figures were either heavily scalped for original cast members, while the rest sat on store shelves for another year. So the property produced some mixed results. To get some "excitement" back in the line Playmates switched to a larger six-inch format, which also permitted them to produce some better head sculpts. No figures were underproduced as chase figures, and there was nothing particularly exciting about the packaging, which was a little darker and more boring than it could have been. The alternative, as some magazines pointed out at the time, was "rehashing" the same head sculpts in new but kind of generic bodies. The upside, as I see it, is that this could have been done very cheaply in terms of investment and development time, and that it could have allowed Playmates to spend the money elsewhere. For example: a Borg cube with lots of Micro Machine-sized ships like Akira, Sabre, Steamrunner, Norway & Enterprise-E. I suspect that they also could have made like 5 different Borg figures instead of one, along with Lt. Hawk, Zefram in flight suit, another version of TNG Locutus from the flashback, Admiral Hayes, Riker in 21st gen clothes, Shelby for no reason, etc. They could have also done an Enterprise-E bridge, which would have been pricey and a headache for stores, but it could have been a TRU exclusive or something like that. 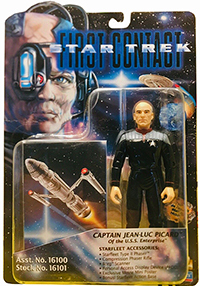 One legacy of the First Contact figures is that the other six-inch figures, which were produced alongside the four-inch ones, that didn't really amount to a big lineup and were kind of ignored at retail, just like the larger Space Talk figures. On the other hand, an argument could be made that the later lines like DST went in the direction of a bigger format, being targeted at collectors, and offered collector pricing and greater detail. The FC figures didn't offer a ton more detail, but they were following some industry trends anyway. Now we have so many size formats for Star Wars figures split along pricing, collectability and detail lines that it's kind of a figure for every wallet. Did Playmates preview this abundance of size formats, but was it too far ahead of its time? Another legacy is that Playmates later (hahah!) went back and produced Picard, Riker, Data and Troi from First Contact for Target stores (but not Geordi), which was kind of waving the white flag at collectors who, predictably, didn't like the larger format. That's about as close to the admission of the First Contact line having been a dud that we could get. One upside of these new uniform sculpts that wasn't taken advantage of in any way is that they could have been used to produce a whole lineup of updated DS9 figures in the smaller format, for almost no money. What do you think about the move to the six-inch format, with the benefit of over 20 years of hindsight? Did it help the line, did it hurt it, or did it not make a difference? The scale change was very disappointing. I bought these because I was still heavily collecting, but they just didnt belong with the vast number of previous figures. Ive had these since their initial release and still havent gotten around to opening them. I just have no real excitement for them. Hated the size change myself. I skipped the line entirely. I was glad they did come around to doing the crew (except La Forge) in the normal size. I think First Contact Beverly was only released overseas? Youre right about a missed chance for an inexpensive update for the DS9 crew and another Kira! Now I want to look back at that huge list of figures I thought they should have made. They went to the trouble of reusing the larger First Contact sculpts for a Sisko, Dax, and OBrien. I didn't find the scale change appealing and never bought any of them. I had lost interest in buying Playmates after the 1701 and Red data debacle. In later years I bought all of the 9" and a several of the 12" and I still had quite a few of the 3 3/4 " on my shelves but after the 1701 thing I never cared about completing those. It still blows my mind how stupid a company can be that would torpedo their own ship like that. I still collected the larger ones, but it wasn't as exciting for me and I didn't buy 2 (one to open, one to keep sealed) like i did with the original line. I do think the larger format hurt the line as well as the 1701 issue. I was also disappointed in the Generations figures since that is when they started losing articulation.